I’ve teamed up with Ghirardelli and feedfeed to share one of my favorite chocolate recipes for Ghirardelli’s Baking Day happening today! 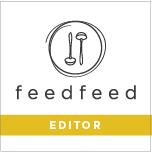 Ghirardelli chocolate has been a staple in my pantry for many years, so when offered the opportunity to collaborate on this special project my answer had to be, “Absolutely.” As a feedfeed editor it’s my privilege to curate their Brownie, Chocolate, and Chocolate Cake feeds. If you’re a first time visitor to Now, Forager you’ll quickly realize that chocolate is my primary inspiration in pastry and confection making. 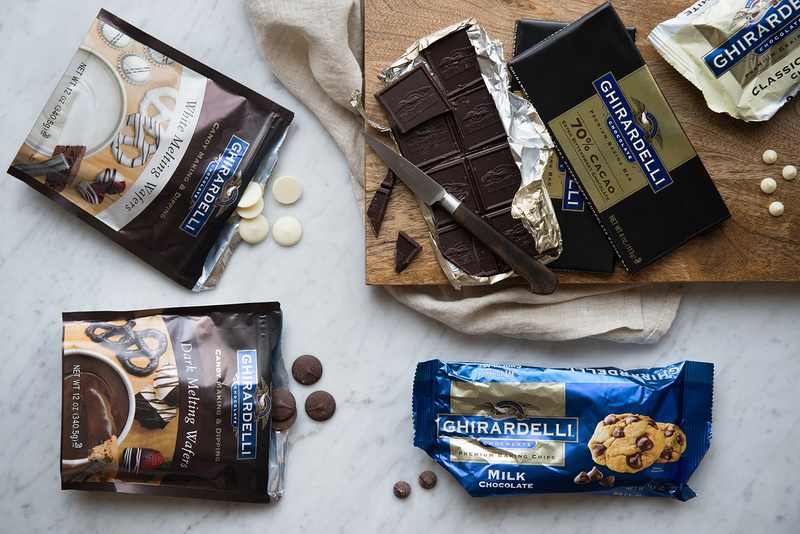 This newly developed original recipe for Ghirardelli is no exception. Ghirardelli Chocolate Dipped Holiday Meringues in three different holiday flavors: Peppermint Candy Cane, Eggnog Hazelnut, and Gingerbread Pistachio. It’s made up of one simple batch of Italian meringue, that’s divided into three equal portions. Each portion is flavored with its own chocolate, spices, oils, and nuts. Peppermint oil, Ghirardelli dark chocolate, and crushed candy canes adorn the peppermint meringues. Eggnog spices dipped in Ghirardelli white chocolate and hazelnuts for the eggnog meringues. Gingerbread spices, Ghirardelli milk chocolate, and pistachios for the gingerbread meringues. All very simple to create, but with plenty of variety of flavor and textures. If there’s a particular meringue flavor you see yourself drawn to, simply make the entire batch that one flavor. Or split the batch between only two flavors. It’s all up to you and regardless of which way you chose to go, you’ll end with a beautiful and luxurious treat. Ghirardelli’s chocolate is excellent for dipping. It adds a smooth and silky texture to the crunch of the meringue. Their 70% extra bittersweet chocolate is for the dark chocolate lover, but their Dark Melting Wafers work nicely for dipping as well. Ghirardelli milk chocolate is creamy and the perfect pairing for warm gingerbread spices. The Ghirardelli white chocolate (or White Chocolate Wafers) is light and buttery, making it a lovely background to the eggnog spices. The flavors are able to shine through in each holiday meringue without being overpowered by the chocolate. 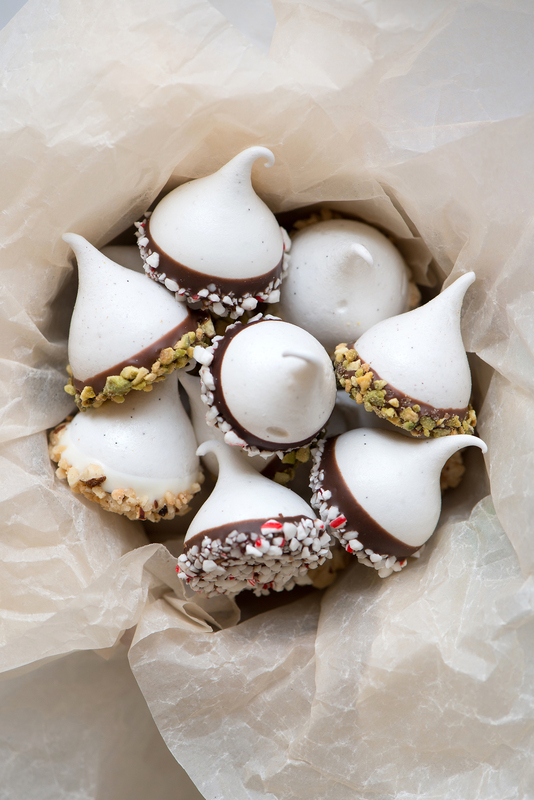 These small meringues make for an excellent gift. They’re sturdy enough to hold their shape in festive packaging and will stay crunchy and flavorful for at least a few days. These little bites of holiday cheer go well with a warm cup of tea or morning coffee (if you don’t mind a little sweetness to start your day). A special indulgent bite, without over-doing it on the holiday sweets this season. Small, luxurious, and pretty to boot. We eat with our eyes first, then smell, and then taste. These holiday meringues satisfy each and every one of the senses. Be sure to also visit Ghirardelli (@ghirardelli) and feedfeed (@thefeedfeed), on Instagram, to find even more inspiring Ghirardelli chocolate recipes and other feedfeed daily featured recipes. 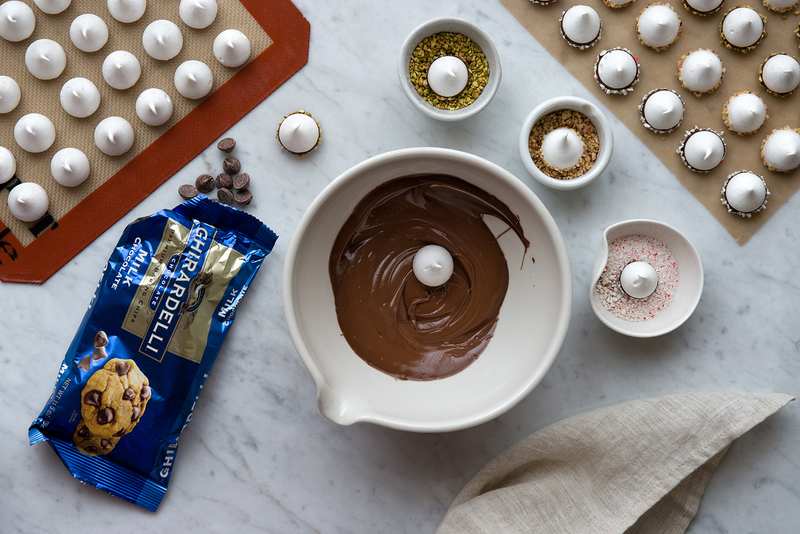 Search the #SweetestSecret as well for even more feedfeed editor’s delicious Ghirardelli Baking Day recipes. Happy Holidays, Dear Friends! Preheat oven to 175F. Line a large baking sheet with parchment paper or a Silpat. Place egg whites and vanilla bean in a stand-mixer bowl with a whip attachment. In a small pot, add sugar and pour water over sugar to saturate. Cook over medium-high heat, until sugar mixture begins to simmer. At this point, begin whipping the egg whites on high speed until stiff peaks form. While the egg whites whip, continue to cook sugar until it reaches 240F. If any sugar sprays onto the sides of the pot, use a pastry brush dipped in cold water to wipe down the sides (this prevents the sugar from crystallizing). By the time the sugar is at the proper temperature the egg whites will have reached stiff peaks. With the mixer on medium-low speed, slowly add the hot sugar syrup to the egg whites. Pour the sugar syrup down the side of the mixer bowl, avoiding the whip, and allow it to stream into the egg whites gradually. This prevents spraying sugar and from over-heating the egg whites. Once all the sugar syrup has been added increase the speed to high and whip whites until cool, about 5 minutes (the bottom of the mixer bowl should be cool to the touch). Evenly divide the meringue into three separate bowls. In the first bowl, fold in the peppermint oil. In the second bowl, fold in the 1/8 tsp nutmeg and Cognac. In the third bowl, fold in the cinnamon, ginger, clove, and pinch of nutmeg. 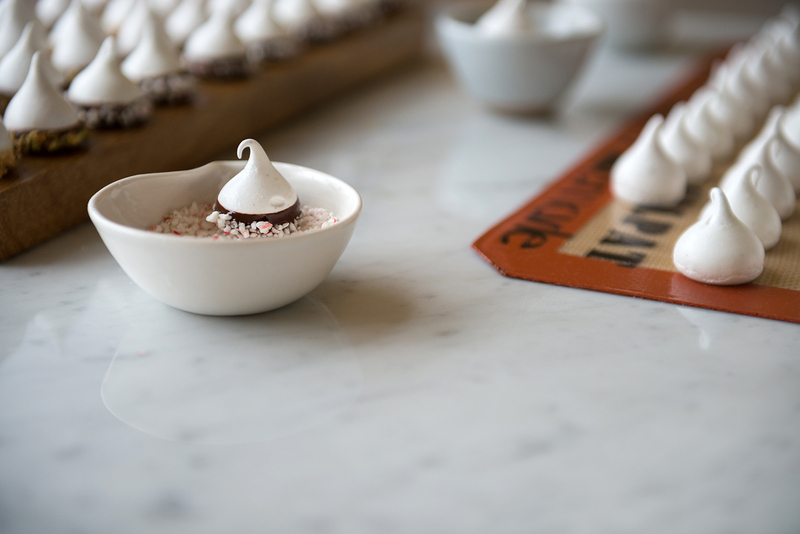 Transfer each meringue flavor into three separate piping bags fitted with a large round tip for each bag (Ateco #806 or #808). If only one tip is available, pipe one flavor at a time and rinse out the tip with cold water between each flavor. 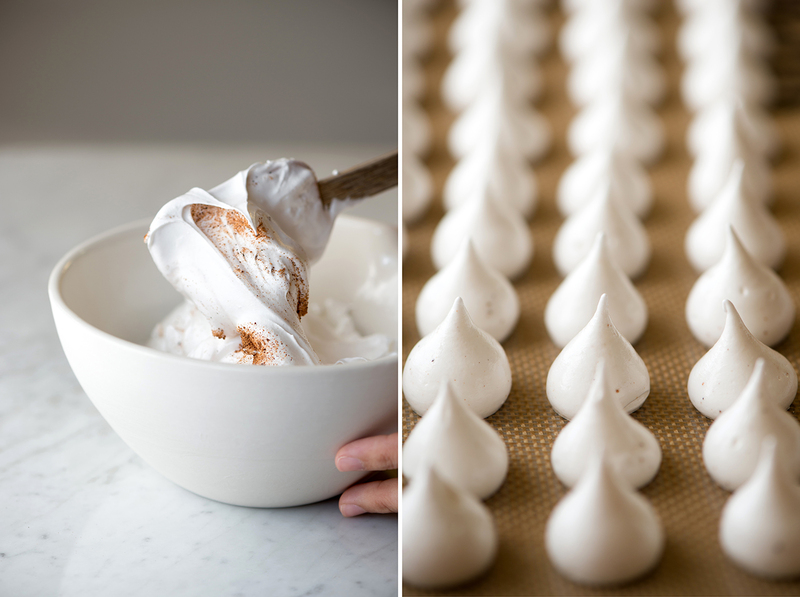 On prepared baking sheet, pipe 1-inch wide meringues into rows, spacing ¼-inch apart. Keep each flavor in the same row to avoid confusion later. To create the peaked shape: Hold piping tip 1/2-inch directly over baking sheet, gently squeeze bag until 1-inch wide base is formed, and then gently pull bag up until meringue breaks away from tip forming a peak. Bake for 2 hours, with oven door just slightly ajar, until dry to the touch. Place a heat-proof spoon in the door if needed, as this will allow steam to escape while baking and prevent the meringues from cracking. Once finished, remove meringues from oven and let cool. Meanwhile, place the crushed candy canes and nuts into three separate bowls. Place dark, white, and milk chocolate into three separate bowls. Heat each bowl just until chips are mostly melted, then stir to incorporate the small unmelted bits. This will help to keep the chocolate in temper and provide a firm setting of the chocolate. 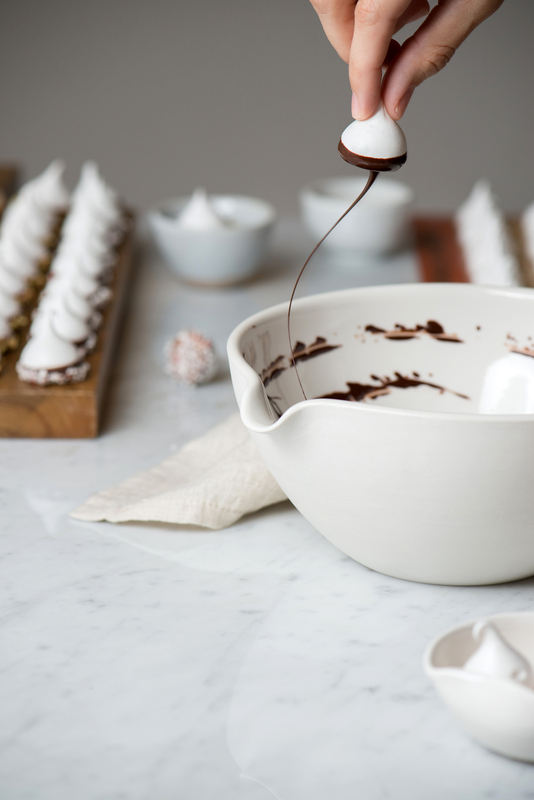 Dip the peppermint meringues into the dark chocolate and then directly into the crushed candy canes. Dip the eggnog meringues into the white chocolate and directly into the hazelnuts. Dip the gingerbread meringues into the milk chocolate and directly into the pistachios. Place all finished meringues onto a parchment or Silpat lined baking sheet to set. Store meringues, in an air tight container at room temperature, for up to three days or seal in gift bags and share with others to enjoy. *Disclaimer: This post was sponsored by Ghirardelli Chocolate and feedfeed. All opinions and thoughts are my own. 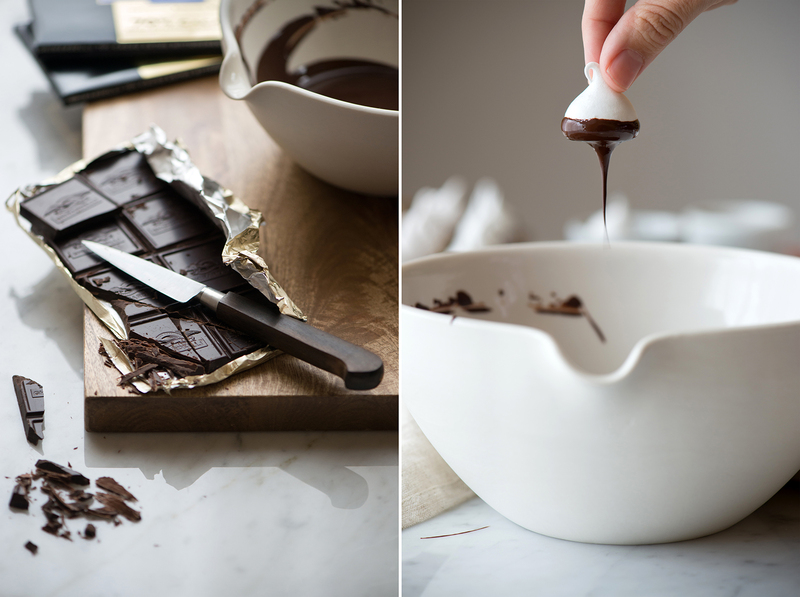 A big THANK YOU to Ghirardelli for their generous provision of the chocolate products to create this recipe and post! Thank you, Nicole! Those ice cream sundaes sound amazing. Love visiting San Francisco and will have to put that on my list of “must eat” on my next visit. It was such fun to create these using their chocolate. Very grateful to have been able to enjoy it this holiday season. Have a wonderful week my sweet friend! Hi Anne! You are too kind, thank you! Sprinkle With Salt is lovely. Everything looks delicious, so well done you! Really happy to know you are enjoying Now, Forager. It’s our little spaces of creativity that makes life a little more beautiful, no? Thank you for stopping by and all the best to you! Such a beautiful gift idea for the holidays! Hi Eden, it would make for a great gift idea this holiday season! Thank you for stopping by. Happy Holidays! I was wondering if they would store for longer in the freezer? Sometimes its easier to make gifts ahead of time but the 3 day fridge storage isn’t long. Thanks! Cant wait to try them. Hi Charlotte! You can certainly try to freeze them; however, I haven’t tried it with these meringues so I’m not sure how they’ll turn out after they’ve defrosted. If you do freeze them, make sure they don’t touch while defrosting and dip/decorate them after they’re thawed. Enjoy them as soon as possible, after thawing, since freezing will affect the final texture of the meringues. Also, please don’t store them in the refrigerator at any time (the storage should be at room temperature). The humidity from the refrigerator will destroy the meringues. Hope you’re able to create them this holiday season!